A sees a stranger, A-5, stealthily remove papers, X, from the pocket of another stranger, A-8, who is asleep. A follows A-5. A sends an infernal machine, X, to his enemy, A-3, and it falls into the hands of A’s friend, A-2. You can read the full poem here at the Paris Review web site. I highly recommend it; it is an oddly captivating poem, suggestive of the strange tangle of human relationships, but also much more. Parts of it chronicle mundane happenings, parts of it fantastic ones. Unless you've got better eyes than I, click to enlarge. I should note that I did not include characters without names unless they had significant relationships to named characters, and that I simplified the nature of some relationships to stop the labels from being overly long. It does reveal some interesting facts. First, is that there are really just two tangles of relationships. There are all the intersections of A, who is married to B-3, and later B, and is nephew of U, and so on. No character with an actual name connects to A's cluster except for Herschel, and no character with a letter name is not contained in it, except for A-4, about whom we know only that he is "missing food from his larder." (Was it stolen by A, though? We know he is a crook.) Some characters are mentioned in multiple contexts, which becomes suggestive: does the tragic adventure that A and A-2 go on, resulting in A-2's death, have anything to do with the infernal machine that A sent to his enemy, A-3, but ended up in the hands of A-2? If A caused the death of his friend, it seems even more tragic than at first glance. 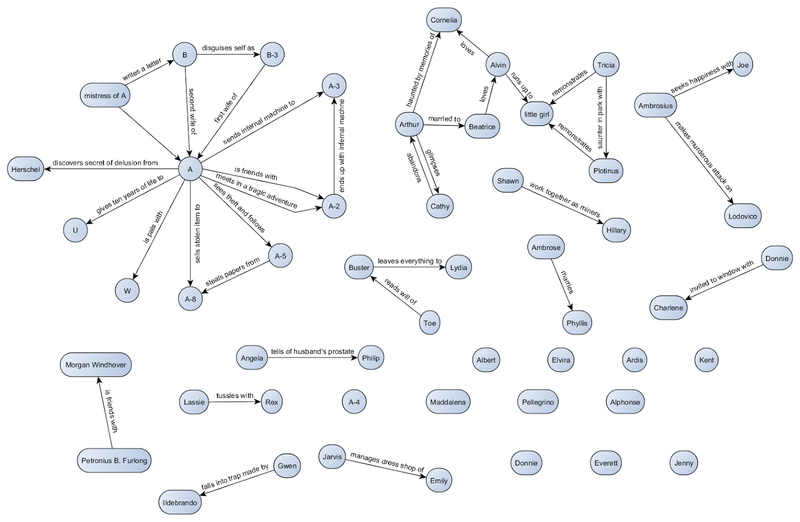 The other significant cluster is in the top middle of the graph, and this one is made up of all named characters (except for a little girl who is mean to a rabbit and transforms into a grown woman). This one is much less centralized than the A cluster, and the relationships more tangled; there are lots of unreciprocated loves and such. What struck me when doing this visualization was the number of characters in no relationship at all. When they're all arranged in whitespace like this, with no lines going in or out, it seems rather sad. It's an interesting way of looking at an interesting poem.